I was very honored to receive an email inviting me to the University of Minnesota’s tenth annual Equity and Diversity Breakfast which will be held on Thursday, November 16, 2017, 7:45-9:45 AM, at the McNamara Alumni Center. The Breakfast will bring together the University community and external stakeholders—alumni, donors, community organizations, and corporate entities—to recognize the students, faculty, and staff doing the work, and to reaffirm the University’s commitment to equity and diversity. Awards will be given to outstanding students and to an outstanding unit promoting equity and diversity. A few years back, I was working on a major project at the University of Minnesota. At the same time, we had a new manager, Matt Nuttall, that started at our department. Our first encounter was not the best, although he did go out of his way to help me get approval to go to Hajj, the pilgrimage to Mecca. At the time, vacations were denied due to the project. I mention this because later on we resolved our differences and I have to say we learned about each other more, and I learned I made some wrong judgments and decisions. Now, our relationship is one of mutual respect. He is also a male ally for the women in technology at the University of Minnesota. We are both in the partnership and collaboration committee. We had a discussion on diversity during our meetings and we had a discussion over the book, Weapons of Math Destruction, How Big Data Increases Inequality and Threatens Democracy. He read the book and learned ways to improve diversity in hiring practices. In partnership with HR, he worked to push standards that promote diversity, not just in representation but also in inclusion. The office of Information Technology HR is incredibly progressive and actively working with the whole department on diversity and inclusion. Last week, we had a team lunch and a few of us went together to Wally’s in Dinkytown. It is a Middle Eastern restaurant and my favorite place to go around campus. The team agreed. We had a new employee at the time from Zimbabwe, how cool is that? I can now say I know someone from Zimbabwe. Although, there is another employee in another department from Zimbabwe, so actually, I now know two people from Zimbabwe. How many people can say the same thing? Below is a picture of our team. I asked our team if I could share it and refer to it as a picture of diversity. While our differences have been used to tear us apart in the media, and at times we may face challenging moments, we can overcome those challenges and learn to mutually respect one another. In this picture, one can see that our differences brought us together for lunch and work. And we can come together to solve all sorts of problems. The person taking the picture is Eduardo Chavez Herrera who is from Mexico. I caught him counting with his fingers once, and keep reminding him in a joking manner that I caught you. Occasionally, we fight on which food is better Mexican or Middle Eastern. He was kind enough to agree to go to Wally’s, but then again, I gave everyone an ultimatum: Wally’s or don’t talk to me until Judgment Day. They realized talking to me was essential to get the work done and agreed to have lunch at Wally’s. Jesus, son of Mary, peace and blessings upon them, is a revered religious figure and the bedrock of Christianity. He also is a venerated figure in Islam, the faith of some 1.5 billion Muslims worldwide. 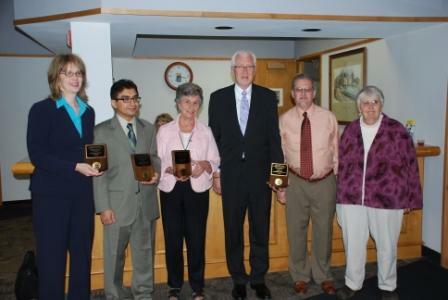 On May 20, the City of Eden Prairie honored American Muslim Community Center (AMCC) and three churches–Eden Prairie United Methodist Church, Pax Christi Catholic Community and Prairie Lutheran Church–with its annual Human Rights Award. The award was in recognition of our participation in planning and executing the Interfaith Worship Service Program in 2006 and 2007. These events brought together hundreds of people of different faiths to celebrate the commonalities held by all and to promote peace, tolerance, and awareness.